Do you customize any items with company logos? how many glasses are included? BEST ANSWER: There are four glasses. Can I put the oneill family emblem on the decanter and glasses? BEST ANSWER: Im sorry we cannot do a logo only what is offered on line. Can I have a private label bourbon added to a Lexington canter and glass set? We just had our last name etched into the decanter set, but we have enjoyed it. What is the Dia. and height of the glass? BEST ANSWER: We do ship international via UPS. If you would like a quote for shipping to your address please reach out to Customer Service at 800-356-8466. Please keep in mind UPS international rates can get costly especially on larger items. Is it possible to buy only the decater? 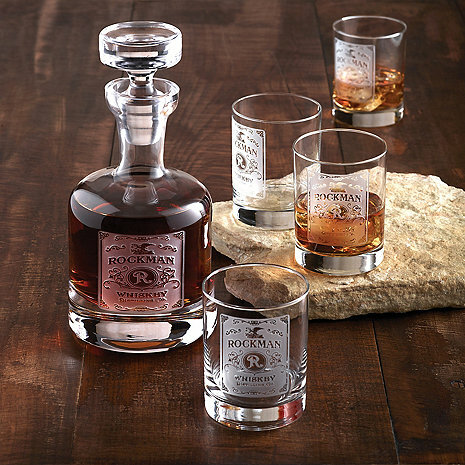 BEST ANSWER: The Personalized Etched Whiskey Label Decanter and Glasses set is offered as a decanter without the glasses. Do they come in a gift box? BEST ANSWER: The Personalized Etched Whiskey Label Decanter and Glasses Set does come packaged in a Wine Enthusiast box. It is a great gift item that is sure to please anyone. This set was purchased for a combined Father’s Day and anniversary present. To say that I am delighted and overjoyed with our purchase is an understatement. The engraving quality and design are exceptional, exquisite and beautiful! I would also like to point out that I ordered this set on 05-24 and received this set on 05-27!! Truly WARP SPEED engraving and shipping!!! Thank You...! This set is beautiful and so worth the price. My husband LOVES it! All of our friends are raving about it wanting to know where it came from. I did extensive research comparing other sets before I ordered bas d on reviews. Other sets showed reviews on the etching not being very deep. The etching on this set is very deep and beautiful. We are thrilled with it and highly recommend it to anyone looking for a nice set. I was excited to receive my order, the quality and workmanship was outstanding, in fact I liked the items so much that I ordered two more sets for gifts for family members. I thought it was a great value and what a great gift. The other surprise was that I received the orders within two days, now that's just crazy. I highly recommend these items and company, they do things right!!! Very pleased with the quality and workmanship of the custom Etched glass decanter. Worth the $ paid. My Bar looks very classy now. I purchased this as a gift for my boyfriend. He was so thrilled with it, he just sat there .... reading his personalized label...over and over. Perfect gift!! Bought this for my fiancé and it's absolutely beautiful. It's deeply etched and looks elegant on the bar. Every time we serve cocktails to our friends they comment on how much they like them. It would be the perfect wedding gift for a special friend or relative. This would have been a beautiful set but to my surprise the etching on the glasses was not straight. These weren’t cheap and I really didn’t think they would have been sent to me that way. Arrived in a flash and was as ordered. The quality is excellent and will be just the correct gift for a son’s milestone birthday.This is a good one. We purchased this set as a wedding gift for our friends. We had it shipped to their house. They were so impressed with them they displayed them at the reception/party. Of course people kept asking about where we got them. I must have told 10-15 people to check out Wine Enthusiasts. Very impressed with the set and plan to purchase one for myself in the very near future! Very nice. Beautiful engraving and the set has a great feel to each piece. The price seems fair and it was delivered faster than advertised. I purchased this as a gift for my spouse and he loved it! The glassware is beautiful. I would purchase this item again. Very high quality. Perfect for my infinity bottle! My husband loves this. It is such a great idea for some-one who is a hard to shop for person. Purely exceptional. Purchased this as a gift for a friend. Perfect. I bought the decanter and 4 glasses. They were just as I had hoped. Very elegant, I'm very pleased with my purchase. Handsome, hefty glassware. Engraving beautifully done. A splendid addition to our home bar. I bought this decanter set for a friend's 70th birthday. He absolutely loved it. He and his wife said it was fantastic. They couldn't thank me enough for it. I had only seen it in the photos of the website. When it came and I saw it in person, it was fabulous! I knew he would like it. This is a super nice gift for someone who likes to entertain guests. The gift was very much liked and placed on our bar for immediate use.